Could Elon Musk Be the Answer to America's Infrastructure Crisis? Subject: Could Elon Musk Be the Answer to America's Infrastructure Crisis? One of President Trump's key campaign promises was to overhaul the infrastructure system, which he labeled a "disaster" throughout his campaign. "We spend $6 trillion in the Middle East and we have potholes all over our highways and our roads … so we're going to take care of that. Infrastructure — we're going to start spending on infrastructure big. Not like we have a choice. It's not like, oh gee, let's hold it off," said Trump to Congress on Feb. 27. However, Trump may be forced to hold it off because a $1 trillion infrastructure proposal might not make it through Congress intact. As we saw from the failed healthcare bid, getting a proposal through – especially one with this much capital involved – is not a guarantee. In this case, smaller, more profitable companies in the private sector may fill the gap. 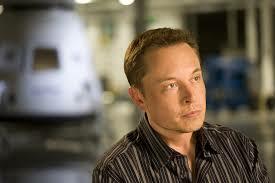 And Tesla Inc.'s (Nasdaq: TSLA) Elon Musk could be the answer America is looking for. "The markets love an underdog with vision, and I can't think of an executive today with more vision than Elon Musk," said Money Morning Chief Investment Strategist Keith Fitz-Gerald, who has long been following the mega-CEO, to his Total Wealth subscribers last year. Elon Musk Is "Building the Future"
The SpaceX founder and CEO has long been an advocate of changing the way the world works. "I don't spend my time pontificating about high-concept things; I spend my time solving engineering and manufacturing problems," said Musk to Bloomberg back in 2013. Indeed, Musk has an impressive resume. He is the second entrepreneur in Silicon Valley (the first one was James H. Clark) who managed to create three companies with a market cap of more than $1 billion. As the Chairman of SolarCity Corp. (Nasdaq: SCTY) and the CEOs of Tesla and SpaceX, Musk has a net worth of more than $15.4 billion, according to Forbes on April 8. 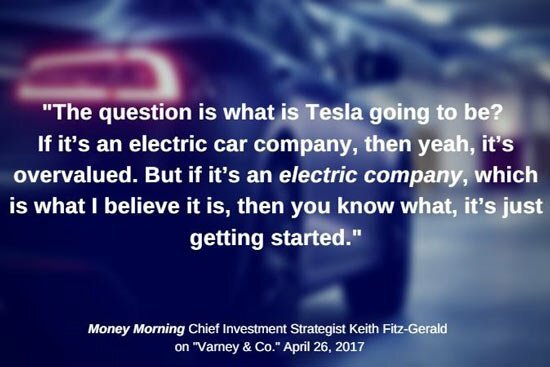 "I think Elon Musk knows exactly what he wants to accomplish [with Tesla]," said Keith on FOX Business' "Varney & Co." last year. "I know that I'm interested, and he's got his eye firmly on what he wants to do." Now, in addition to his multiple high-profile projects, Musk has set his sights on a new challenge: America's crumbling infrastructure. Musk has been trying to solve U.S. infrastructure as far back as 2013, when he unveiled a concept for high-speed transportation as a way to cut long-distance travel times and help reduce congestion in many cities. The high-speed rail, dubbed the "Hyperloop," involves propelling pods through a large tube at up to 750 mph using magnets – shortening an over two-hour commute into just 12 minutes. "Traffic is driving me nuts," Musk tweeted from his Twitter account in December. "Am going to build a tunnel boring machine and just start digging…"
As it turns out, he wasn't joking. In his April 28 TED Talk, Musk confirmed he has begun to lay the foundation for thousands of underground tunnel networks throughout the United States. "Tunneling into the Earth solves the problem posed by congestion created in dense cities with tall buildings and limited street space," said Musk. The project tunnels would transport cars on an electric skate that would then propel them through the tunnel at over 130 mph – fast enough to get from Westwood to Los Angeles in five minutes, Musk said. By car, that commute would take well over an hour. He's calling the venture the Boring Company. The company is currently building a demo tunnel in the SpaceX parking lot until it gets permission from the city of Los Angeles to extend beyond the property line, according to an April 29 report by Business Insider. However, tunnel boring is no easy feat, and the process is notoriously expensive. "Tunnel projects often cost 32% more and take 22% more time than expected as a result of uncertainties and unforeseen obstructions associated with drilling," said Bent Flyvbjerg, a professor at Oxford's Saïd Business School who studies large-scale infrastructure, to Bloomberg on Feb. 16. You see, Musk has gained support from the new administration. On April 4, Trump economic advisor Gary Cohn touted Elon Musk's infrastructure solution on CNBC. "Not only can [Musk] tunnel, but he can beat high-speed rail," said Cohn. And at a White House town hall meeting for CEOs and business leaders on April 4, Cohn confirmed the Trump administration has been soliciting Musk for ideas on how to construct new rails and roads for better transportation around the country. Interesting. Musk must have read Robert Heinlein's "The Roads Must Roll" (1940). The idea is the same. Check out GM's proposal at the 1970's Seattle Worlds Fair. Same idea with 2 working model. There were 2 variations. The barriers to completing any tunnels: funding (which Congress won't pass in any form – as the short sighted , cheap skate republicans have their own secret,hidden agendas: getting re-elected); and buried underground utilities -try getting approval from the various county,city ,state and federal agencies – a complete ,soul crushing exercise in wasted time and stupidity.The government agencies are so buried in red tape it's obscene.As the agencies are run by non-thinking paper pushers. You think LA is going to let this attention-deficit addled bozo start boring tunnels, willy-nilly under Orange County? Does he have the necessary permits to do any digging at all, other than on Tesla/SpaceX property? Will private landowners with an ounce of common sense allow tunnels under their property? No. This is yet another "shiny object" being dangled in front of the eyes of investors and fanboys of the Tesla/Musk cult to distract them from the coming the Model 3 "production" embarrassment.